Ford engine production in the UK would be at risk from a no-deal Brexit. LONDON -- Ford would have to take a "long, hard look" at its British operations, which include two engine factories, if Britain leaves the European Union without a deal, Ford's Europe Chairman Steven Armstrong said. "If we were to get to a no-deal Brexit then we would have to take another long, hard look at the operations that we have in the U.K.," Armstrong told Sky News. Armstrong said Ford is stocking engines in Europe and components in Britain alongside bringing more vehicles into Britain, the company's third-largest global market where it builds engines but no vehicles. Ford is spending tens of millions of euros preparing for a possible no-deal Brexit on measures such as currency hedges and shifting inventory between countries. The company has yet to decide on its longer-term plans for Britain, he said. "We love being in Britain, but it has to be competitive and if it's not competitive then we will have to take whatever actions we will need to take to protect the business," he said. Armstrong told Reuters at an event in the Netherlands on Tuesday. 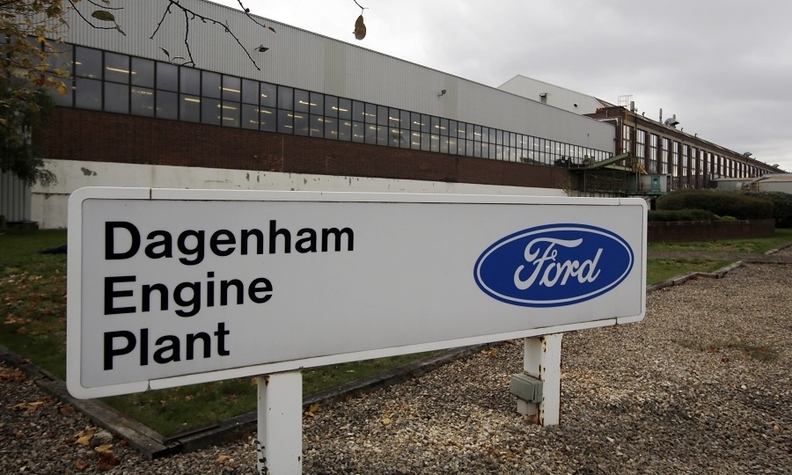 Ford produces 1.3 million engines a year at two British locations, Bridgend and Dagenham. The engines are shipped for fitting in vehicles in Germany, Turkey, the United States and elsewhere. They could face delays and extra costs from a no-deal Brexit. The automaker imports cars into the U.K. from Germany, Spain and Romania in the EU. Ford has warned it could face $1 billion in tariff costs in case of a so-called hard Brexit. While the company has announced 5,000 job cuts in Germany, its second-biggest European market, it has yet to make major decisions in Britain, which is its biggest in the region. Armstrong said the best case scenario was that money spent preparing for Brexit would be "wasted." "We have been clear with the governments in the U.K. and also in Brussels, we have to maintain frictionless trade at the borders and tariff-free trade," Armstrong said. "We have spent the last 40 years putting a business together that relies on cross-border trading," said Armstrong, who is overseeing an overhaul of Ford in Europe to refocus on its strong position in commercial vehicles and on popular European lines such as Fiesta, Britain's top-selling passenger car. "We can't radically reshape on day one so you would have to live with tariffs for a period of time," he said. Ford has hedged against the possibility of a sharp fall in the value of the pound through the end of 2019, while stockpiling inventory would help bridge a one or two month period of potential chaos around Brexit," Armstrong said. "But it's impossible really to mitigate the financial impact in the longer term of no-deal," he said. Ford could try to pass on higher tariff costs, but that would be difficult in Britain, where a recession would mean falling sales, he said. "We haven't really factored in completely the negative shock. There are a number of things that we would try to do but the reality is it would impact the whole of industry, not just Ford," Armstrong said.